A brow lift can make you look younger and less tired by eliminating sagging wrinkles and the horizontal lines that form with age and that are exacerbated by stress. Daniel Man, M.D., a Florida board-certified plastic surgeon, performs brow lifts on people living in and around Boca Raton, FL, to reveal a more rested and younger appearance. 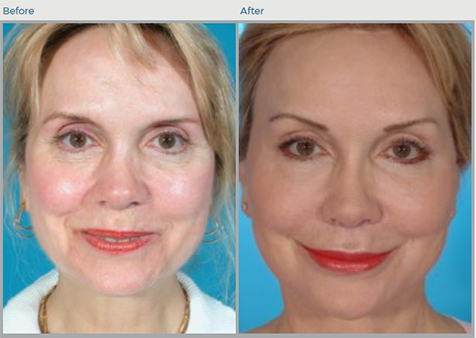 Dr. Man’s Patients Give Video Reviews of Their Brow Lift Results! Learn more about Brow Lift Surgery! A brow lift, also known as a forehead lift, is designed to tighten the soft tissues of the forehead, removing lines and wrinkles. This can restore a more youthful contour to the forehead, upper eyelids, and eyebrows. Brow lifts rejuvenate the upper third of the face by smoothing out forehead creases and frown lines, eliminating sagging skin from upper eyelids and elevating the eyebrows, to restore a fresh, youthful appearance. There are various brow lift methods involving different lengths of incisions in different locations. A brow lift repositions a low or sagging brow, raises the eyebrows and restores the arch, and creates a happier, friendlier look. If you can lift the skin above your eyebrow, creating a pleasing arch, and the loose skin on your upper eyelid is mostly eliminated, a brow lift could be perfect for you. Brow lifts are often performed in conjunction with blepharoplasty (eyelid surgery) as a forehead lift does not improve baggy lower eyelids or crow’s feet around the eyes. How Involved is the Brow Lift? Most brow lifts are performed endoscopically with only small incisions made in the scalp above the hairline where scars are hidden. There are three main kinds of brow lifts – the endoscopic brow lift; the limited incision (temporal) brow lift; and the open brow lift, also referred to as the classic or coronal lift. Endoscopic brow lift: This type is appropriate for patients with moderate brow drooping and horizontal lines in the forehead. Several short incisions are placed in the hairline. Using an endoscope (a narrow, fire optic light telescope and camera), the forehead skin is lifted and repositioned and fixed in place. This brow lift is particularly useful with younger patients who do not require the removal of excess skin. There may be a loss of sensation or hair at the incision site although minimal, and recovery time is much faster than with other lifts. Since an endoscopic brow lift can significantly reduce the frown lines between the eyes, it is often performed at the same time as upper eyelid surgery for optimal results. Limited incision brow lift: Also called a temporal lift, this procedure is best for patients without severe center of the forehead wrinkling or droop, but want to lift the outside parts of the eyebrows and reduce crow’s feet. This kind of lift requires only small incisions at each side of the face at the temples and is also often combined with an upper blepharoplasty, or eye lift, to create a youthful looking appearance. 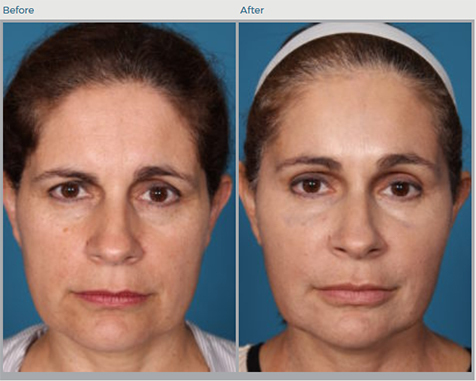 This kind of lift can also be combined with injectables to help freshen the face and provide an overall youthful look. Open brow lift: This procedure is suitable for patients with advanced brow droop and deep wrinkles in the forehead. The incision is from ear to ear over the top of the forehead behind the hairline to hide the scar. The skin is carefully lifted, excess fat and skin is removed, and the incision is closed creating a smooth forehead and naturally raised brows. This is the most aggressive kind of lift, and the most traditional, and is used for patients who simply cannot get the desired results from a less invasive procedure. Dr. Man assesses each patient’s facial issues, considers the hairline and hair style preferences, and recommends what will yield the least scarring and the best cosmetic results. After removing excess tissue, skin, and muscle, Dr. Man closes the incision with small stitches. Hair and face will be cleaned, so the scalp skin does not get irritated. The treated area will be treated with gel and then wrapped with a sterile padding and elastic bandage to minimize swelling. After surgery, patients are taken into a recovery area to be closely monitored. While most patients leave the facility once they are able, some opt to stay and recover in our well-appointed facility under the care of qualified staff. The caregiver is given detailed instructions about postsurgical care. Dr. Man’s instructions cover incision care, normal symptoms, and potential signs of complication. Icing or cold packs around the eyes for the first 48 hours helps reduce swelling and relieve pain. Pain relievers also help diminish discomfort. It is important for patients to elevate the head and back during sleep for approximately five to seven days. Patients may also shower or bathe on the day after their brow lift surgery. Be careful with hot water, hairdryers, and combs as your scalp will be numb. During the first week of recovery, patients may be mildly active but should avoid heavy lifting or strenuous activity. They should not drive for the week or two following surgery depending on their alertness and response time. Patients may return to light work within a week and full activity within a few weeks; however, they must continue to avoid heavy lifting. Within a month, patients may return to a normal routine. Sensation in the scalp may be temporarily reduced for a few weeks. It slowly returns starting with an itchy feeling as the nerves reconnect. Patients may have complete or near complete numbness directly behind the incision in an open brow lift for nine to 12 months post-surgery. Patients schedule follow-up visits two to three days after surgery. Stitches are removed after one week has passed. Results are fully visible within six months. A brow lift can keep you looking youthful for years, with only minimal sagging as gravity reasserts itself. A healthy lifestyle, proper skin care regimen, and adequate sun protection will help to maintain and extend the results of the brow lift. The cost of a brow lift varies with each patient depending on the extent of the procedure and whether it is combined with other facial surgery procedures. During a consultation, Dr. Man goes over the costs associated with the procedure, as well as payment options and financing. Your initial consultation is your chance to discuss what you want to achieve. Dr. Man evaluates you as a candidate for brow lift surgery and explains what a brow lift can do for you. He may suggest additional or related procedures depending on your ultimate goals. Daniel Man, M.D., a Florida board-certified plastic surgeon, performs brow lifts on individuals living in and around Boca Raton, FL, who want a rested, relaxed appearance. Please contact us to set up your consultation today.